Practice Area: Putting green and practice area. Description: This course -- known for years as Fox Den Country Club -- north of Charlotte off I-77 has Crenshaw bent grass greens and Bermuda fairways. It was designed by renowned architect Clyde Johnston with beautiful rolling terrain and scenic views. 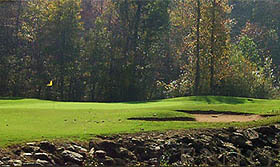 Stonebridge Golf Club purchased Fox Den in May of 2014 and renamed the course Larkin Golf Club. It is a well rounded course with lots of variety that will test your shot making abilities. The course length varies from 7005 yards from the gold tees down to 5300 yards from the red. The first few holes offer a parkland feel, set on mildly undulating land. 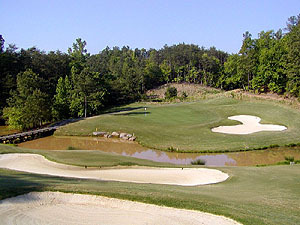 The next six holes will remind you of mountain golf and the last six will make you feel like you're on a beach course. Notes: The course winds through a nice residential community and features a two-story brick clubhouse, pool and tennis courts. B-Man's Take: I have never played this course but along with a few others on my site it has a place on my Must-Play-Soon list. I get notes and updates about this course frequently and know that many golfers enjoy it. 7/20/17 - Msg Board Posting by BetterThanMost titled "Larkin Golf Club"